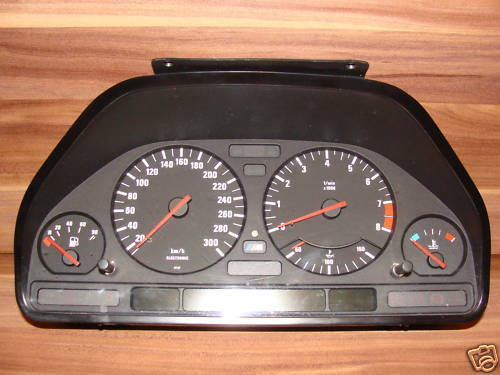 Three different versions of the E34 instrument cluster exist. This is not entirely true. 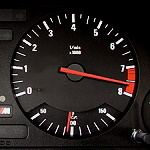 Some models does have a simpler instrument cluster version (for example without Check Control). It's found on the 518i, 520i, 524td, 525td and 525tds models. Note that these also had mechanical odometers but from 09/90 they all got digital odometers. 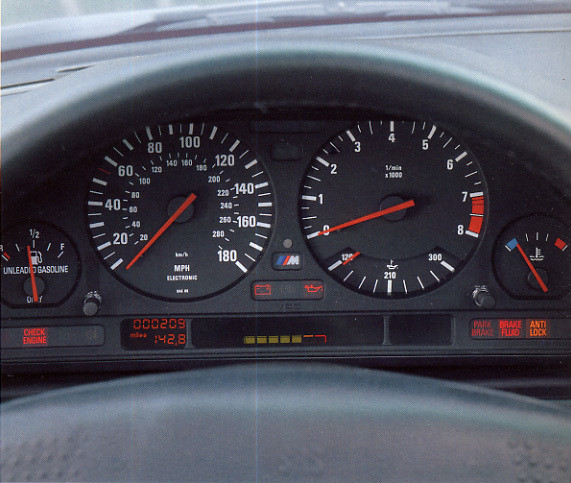 But in this article we focus solely on the "full-sized" instrument cluster. 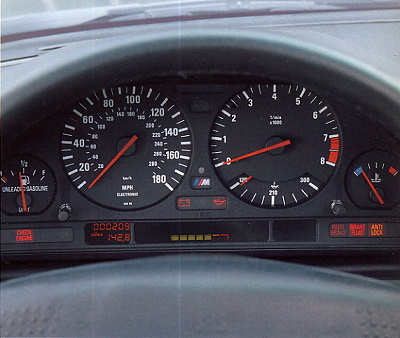 Apart from this the E34 M5 have a unique instrument cluster as well. The speedometer is graded to 300 km/h, the tachometer to 8000 rpm, fuel gauge graded to 90 liter, oil temperature gauge instead of the econometer, needles red instead of white. 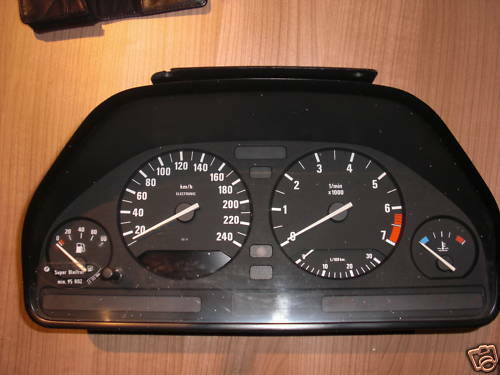 It should also be noted that all E32 models have exactly the same instrument clusters as the E34 models. This bug/feature is only applicable for Gen I instrument clusters. It does not occur on either Gen II or Gen III instrument clusters. When the odometer hits 299.960 kilometers it stops counting! Picture 1 : Example of how the 299960 bug/feature looks like. I have never heard a sensible explanation from BMW why the Gen I instrument clusters does have behave like this. When asking BMW Sweden they said it was due to security reasons. This feature does not work on Gen I instrument clusters - you need a Gen II or Gen III instrument cluster to be able to do this. During this self test the instrument cluster will light up all light bulbs, move the meter needles and display some text including the chassis number. To perform the self test, keep the check control button pushed in (or trip meter reset button if you don't have any check control button) and turn the ignition to position II (RUN). Let's first state that it is possible to replace your instrument cluster with one from another generation or model. But there are a lot of things you need to look out for and what you should be aware of - here we will go through all these differences. Let's start with the obvious - the difference between markets such as Europe and North America. 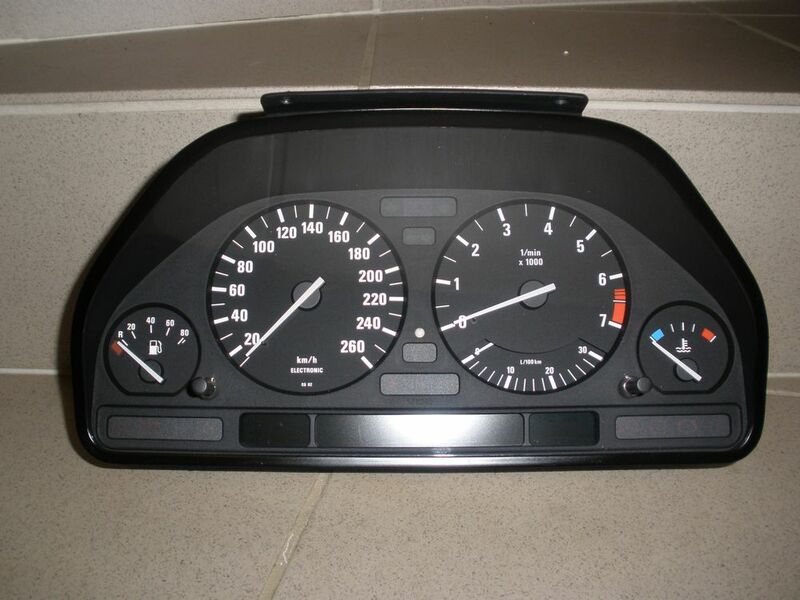 Due to different legal requirements the instrument cluster between these two markets are totally different. The North America (and other markets) have the fuel gauge graded differently (empty, 1/2, full), the speedometer graded in MPH (and in smaller text km/h), the econometer graded in MPG, text instead of symbols. 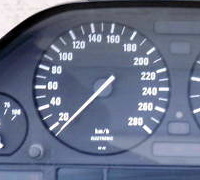 Picture 2 : Example of an instrument cluster designated for the North American market. In this article we will solely focus on the Europa market but most of the information is applicable to other markets as well. Three different versions exists and you should of course keep the same type if you switch instrument cluster. 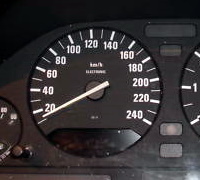 There are (AFAIK) four different versions of the speedometer. Also here, you should of course keep the same type if you switch instrument cluster. 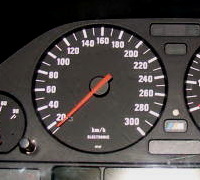 The 300 km/h version is only used in he E34 M5 model (the M5 differs at more places such as the red needles and the econometer is replaced with an oil temperature meter). For more information about specific E34 M5 details, see the E34M5.SE site. Does it exist a 320 km/h version for the E34 M5 as well? Well, it might do - see the picture below! I have no information that such should exist - if you know something more about this let me know! 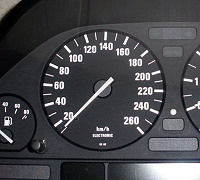 Picture 3 : Does a 320 km/h instrument cluster exist? The european fuel gauge versions differs only at the capacity (and models with a diesel engine will have "DIESEL" printed below the pump symbol). You should of course try to get the same type if you switch instrument cluster. There are (AFAIK) four different versions of the fuel gauge. When it comes to tank capacity I know that E34 models with metal tank (quite rare - I haven't yet found out which models have these) has a capacity of 81 liter. But most E34 models have the plastic tank which has a capacity of 80 liter. The exception is the E34 M5 which had a capacity of 90 liter and were always a metal tank (the Tropical, Gulf and Japan versions had only 81 liter capacity though). Every instrument cluster has a code plug that is matched to that specific car the instrument cluster is mounted in. 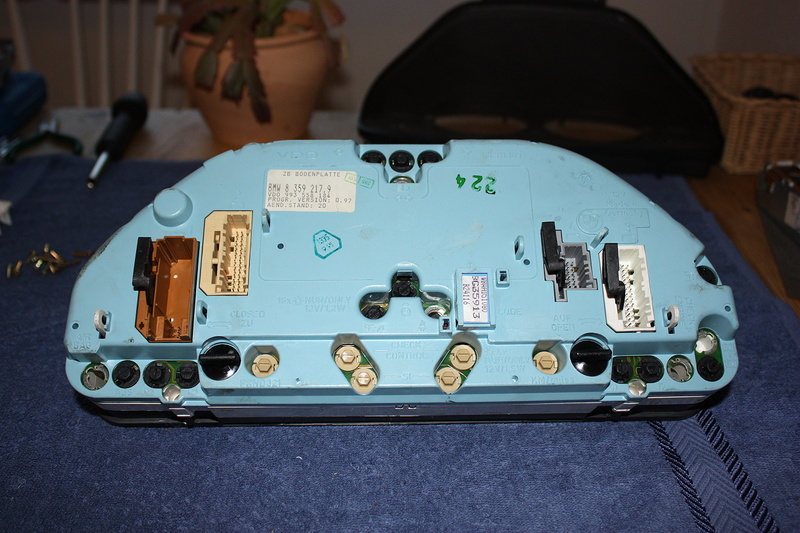 In the Gen I the code plug is located in one of the cable contact housings but in Gen II and III the code plug is located at the back of the instrument cluster. 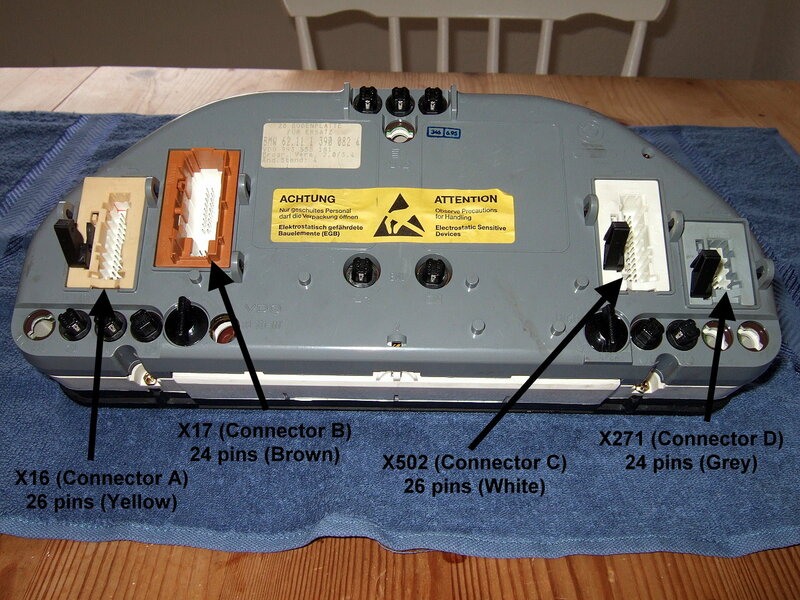 Picture 4 : Example of two code plugs. As you understand most of these numbers must match you car, otherwise a lot of the information displayed in the instrument cluster and OBC will be incorrect. So you can not simply take a code plug from any arbitrary model and put into your car. 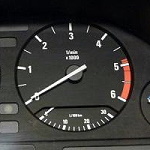 If the value describing the number of cylinders is mismatched, then the tachometer will show incorrect value. Also the econometer will show incorrect value as well as all the OBC functions regarding fuel consumption (since the fuel consumption calculations are based on the fuel injector opening times and number of cylinders). Pay extra attention when you want to remove a code plug. 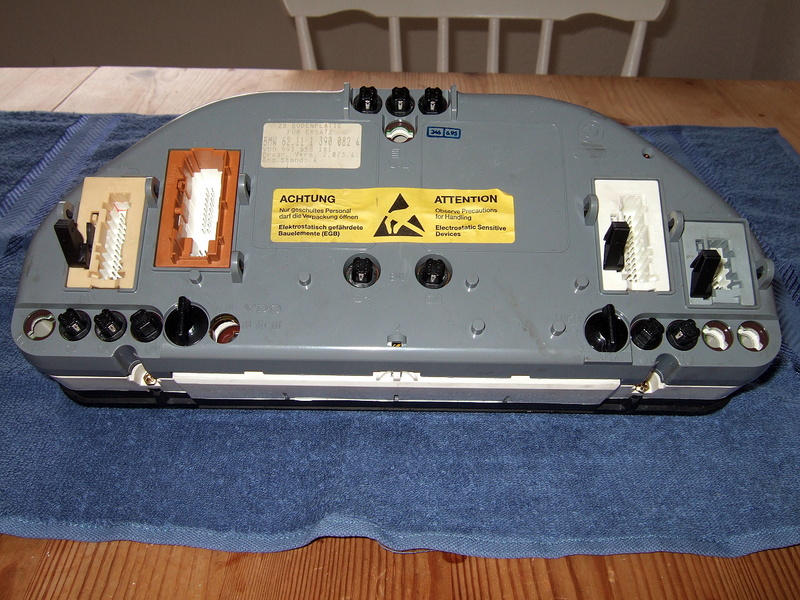 You should disconnect all connectors on the back of the instrument cluster with the battery disconnected and wait a few minutes for all residual power to drain to keep from damaging the memory on the code plug. 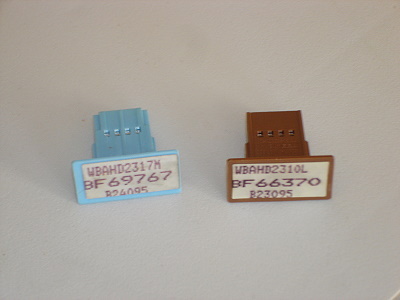 Also since the OBC shares data with the code plug, the plug to the OBC on the back of it must be disconnected and wait at least one minute after the code plug has been changed. This will reset the OBC for the new coding plug. I have a faulty Gen I instrument cluster and want to replace it, or I want to get rid of that awful 299.960 bug/feature - can I simply plug in a Gen II/III instrument cluster? Yes, you can. 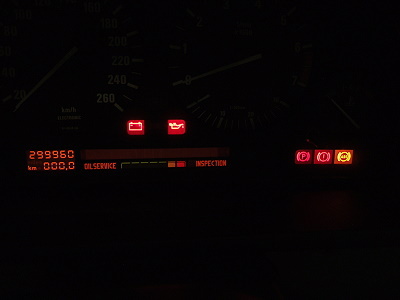 I've tried it succesfully on my 535i E34 (build date 1988-07-07). 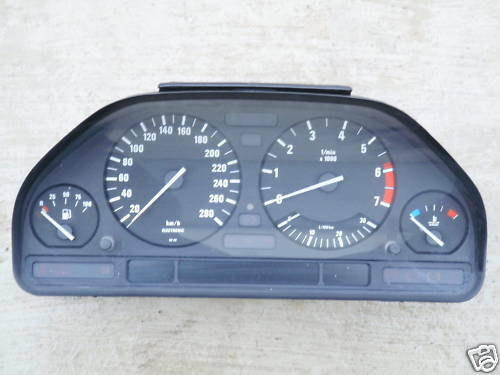 I took an Gen III instrument cluster from a 525i E34 (build date 09/1991 with an M50 engine) and put it into my 535i E34 (which had a Gen I instrument cluster). The first issue you will encounter is that you suddenly discover you have two code plugs! Since you had a Gen I your original code plug is still attached to the one of the cable connector housings (and the other code plug is located at the back of the Gen III instrument cluster. However you can simply ignore this and just connect all the cables as normally. 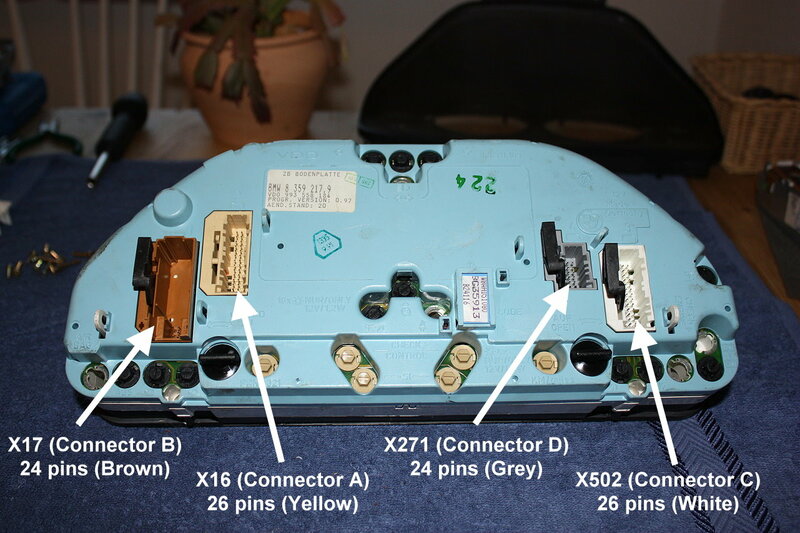 On the Gen II and II instrument clusters they have removed all the pins that used to be connected towards the code plug located in the cable connector housing. 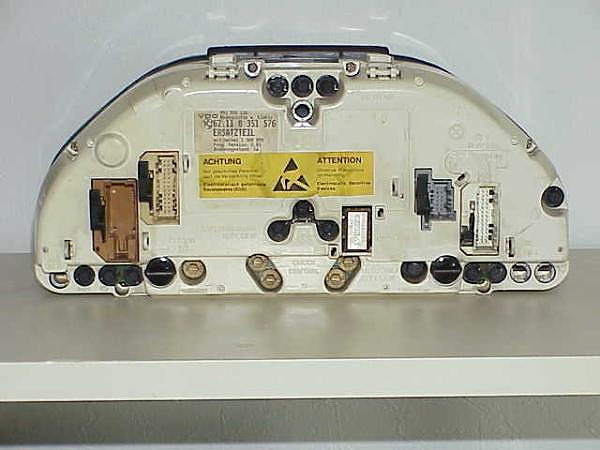 There is simply just one code plugs electrically connected - and that's the one that is located on the back of the instrument cluster (the one in the cable connector housing is no longer connected and just a dummy). 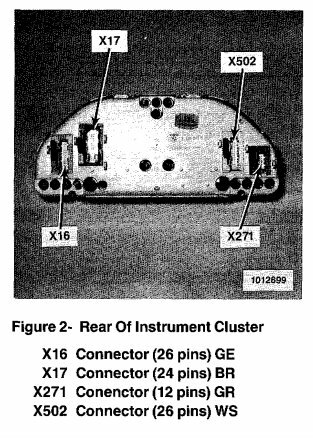 The next issue you will encounter is that the the grey connector on the back of the instrument cluster has been relocated between Gen I and Gen II/III. On Gen I this is located to the far left but on the Gen II/III it has been moved towards the middle. When you try to connect the cable into this grey connector of your new Gen II/II instrument cluster you will find that the cable is almost too short! It's very fiddly but it's possible! If you choose to not have the grey connector cable connected, you will loose the speedometer and fuel gauge functionality (maybe more but these two functions I have verified myself that I loose). 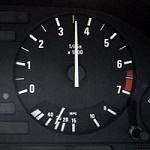 There are four connectors at the back of the instrument cluster (fewer on the simpler version). Many wiring diagrams refers to the connectors by designations, so here is a description of what connector corresponds to what designation. Picture 5 : The name of the connectors for a Gen I instrument cluster. Picture 6 : The name of the connectors for a Gen I instrument cluster. Picture 7 : The name of the connectors for a Gen III instrument cluster.